With an arc that is forgiving to variations in arc length and travel speeds, the Millermatic® 211 MIG welder lets you weld material from 24 gauge to 3/8-inch-thick in a single pass. And the Advanced Auto-Set™ includes five wire/gas combinations — making it easy to start welding with the exact parameters you need. (PAT)>> WELCOME TO ENGINE POWER. 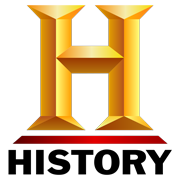 TODAY WE REACH THE FINAL FRONTIER ON A PROJECT THAT'S BEEN A LONG TIME IN THE MAKING. 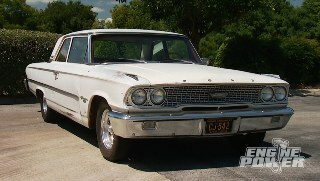 WE ARE FINISHING UP OUR 1963 GALAXIE PROJECT AND GETTING IT RUNNING UNDER ITS OWN POWER. 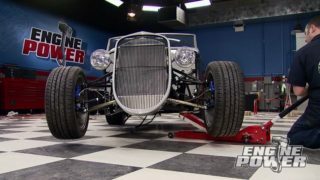 A PILE OF PARTS AND TON OF WORK HAVE GONE INTO TO MAKING THIS CAR AN ABSOLUTE BEAST, AND HERE'S HOW WE GOT IT TO THIS POINT. (MIKE)>> THIS BARN FIND CRUISER CAME INTO THE SHOP IN MOSTLY ORIGINAL CONDITION, RIGHT DOWN TO THE FACTORY PAINT, OR WHAT'S LEFT OF IT. TO SEE WHAT IT MADE BEFORE WE STARTED ANY TEARDOWN WE STRAPPED IT TO THE CHASSIS DYNO. ROWING THE THREE SPEED COLUMN SHIFTED TOP LOADER INTO TOP GEAR, THE MILDLY BUILT 351 WINDSOR CRANKED OUT A SMOOTH AND RESPECTABLE 328 HORSEPOWER AT THE TIRE. (MIKE)>> AFTER WE HAD OUR FUN WE PLUCKED THE POWER PLANT OUT OF IT. 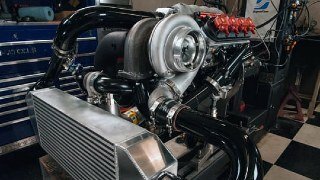 (PAT)>> MAKING WAY FOR A SINGLE TURBOCHARGED 347 INCH STROKER SMALL BLOCK FORD WE BUILT A WHILE BACK CALLED "LITTLE BLACK AND BLUE". LOW BOOST BREAK IN PULLS YIELDED 806 HORSEPOWER, WITH PLENTY LEFT TO GO. AFTER OUR FAB WORK WAS DONE. THAT IS A NICE JOB RIGHT THERE. THE CAR ITSELF MADE A TRIP TO COFFEY FABRICATION AND RACE PREP IN NASHVILLE, WHERE A TRICK FULL SUSPENSION UPGRADE WAS INSTALLED USING CHRIS ALSTON'S CHASSIS WORKS COMPONENTS. 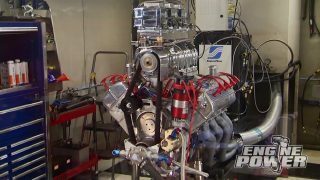 (MIKE)>> BACK IN OUR STUDIO A BILLET FLYWHEEL, TWIN DISC CLUTCH, SFI BELL HOUSING, AND A MAGNUM SIX SPEED TRANS ALL COURTESY OF AMERICAN POWERTRAIN WENT IN. A LITTLE MORE FAB ON ODDS AND ENDS GOT US TO THE POINT WHERE WE ARE STARTING TODAY. (PAT)>> A VEHICLE WITH THIS POWER LEVEL NEEDS COMPONENTS THAT WILL TAKE THE ABUSE. SO WE CUSTOM ORDERED A CARBON FIBER DRIVESHAFT FROM THE DRIVESHAFT SHOP. NOW THEY USE SONNAX COMPONENTS BECAUSE OF THEIR EXCELLENT QUALITY AND SUPERIOR STRENGTH, LIKE THEIR YOKES, UJOINTS, AND DRIVESHAFT ENDS. THE DRIVESHAFT SHOP BONDS THE ENDS OF THE TUBE UNLIKE OTHER COMPANIES. THE TECHNIQUE ELIMINATES THE SEPARATION, OR UNBONDING, OF THE ENDS FROM THE CARBON FIBER SHAFT. THESE SHAFTS HAVE BEEN TESTED TO OVER 2,500 POUND FEET OF TORQUE WITHOUT FAILURE. (MIKE)>> FIXIE HAS BEEN MANUFACTURING WHEELS SINCE 1992. NOW THEY'VE ROLLED CARS TO CHAMPIONSHIPS IN THE SPEED WORLD CHALLENGE, AMERICAN LE MANS, AND SEVERAL OTHERS AROUND THE WORLD. THEY ALSO OFFER A CLASSIC LINE OF FORGED MODULAR WHEELS IN 17 AND 18 INCH DIAMETERS. THESE ARE THE PRO FUEL FIVES. WE'RE RUNNING 18 BY 11'S OUT BACK AND 18 BY NINE UP FRONT. THEY WERE CUSTOM ORDERED TO OUR SPECS. A MODULAR WHEEL IS CONSTRUCTED BY USING TWO RIM HALVES AND ATTACHING THEM TO A FORGED CENTER PIECE. NOW THAT DESIGN MAKES A SUPER STRONG BUT LIGHT WEIGHT WHEEL. NOW HIGH END FINISHES AND AIRCRAFT GRADE COMPONENTS MAKE THIS A VERY, VERY NICE CUSTOM WHEEL. FOR TIRES WE CALLED OUR FAVORITE PARTS HOUSE, SUMMIT RACING EQUIPMENT. NOW WE ORDERED NITTO NTZEROFIVE IN 275/40 18'S FOR THE FRONT. (PAT)>> VIBRANT PERFORMANCE IS THE GO TO SUPPLIER FOR PIECES AND PARTS FOR PLUMBING TURBO SYSTEM, AND THEY EVEN OFFER INTERCOOLERS IN VARIOUS STATES OF COMPLETION. 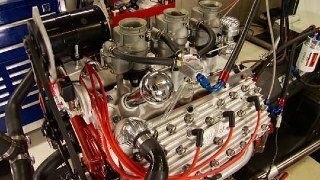 THIS IS A FULL CUSTOM THAT THEY BUILT FOR US TO OUR SPECS, AND THAT WAS AS EASY AS US GIVING THEM DIMENSIONS AND THE HORSEPOWER LEVEL OF THE ENGINE. THIS PARTICULAR ONE HAS A FOUR AND A HALF INCH CORE WITH A VERY LARGE COOLING SURFACE. THE INLET AND OUTLETS ARE BOTH THREE AND A HALF INCHES AND UTILIZE THEIR HD CLAMP, WHICH WE'RE GONNA SHOW YOU VERY SOON. (MIKE)>> FOR MOUNTING PURPOSES TWO TABS WERE WELDED TO THE TOP OF THE COOLER. SIMPLE THROUGH BOLTS SECURE THEM TO THE CORE SUPPORT. ON THE BOTTOM ANOTHER BRACKET WAS WELDED ON. A FASTENER GOES INTO A NUTSERT WE INSTALLED IN THE SUPPORT. IF IT GOES IT MUST BE ABLE TO STOP. SO NEW BRAKE LINES ARE GOING ON, STARTING WITH THIS FLEX "T". WE WELDED A STUD ON THE HOUSING, WHICH SECURES IT. NOW THE RIGHT SIDE HARD LINE ATTACHES TO THE "T". THEN TO THE OUTER FLEX LINE. THE SAME GOES FOR THE RIGHT SIDE. UP FRONT WE TIG WELDED THE BRACKET FOR THE TRANSITION FITTING TO THE FRAME RAIL. NOW THE FITTING IS INSTALLED USING A RETAINING CLIP. THE BRAIDED FLEX LINE ATTACHES TO IT. THEN TO THE CALIPER. (PAT)>> A SINGLE LINE RUNS FROM THE INLET OF THE FLEX "T", ALONG THE FRAME RAIL, AND UP TO THE PROPORTIONING VALVE, WHICH IS ATTACHED TO THE MASTER CYLINDER. FROM THE FRONT PASSENGER SIDE BRAIDED LINE ANOTHER HARD LINE RUNS ACROSS THE CROSS MEMBER, AND UP TO THE DISTRIBUTION "T". SAME GOES FOR THE DRIVER'S SIDE. FINALLY THE LAST LINE RUNS UP TO THE MASTER CYLINDER. WE'LL BE BACK IN A FEW MINUTES. (MIKE)>> THAT'S GONNA LOOK GOOD. WELCOME BACK. WE JUST FINISHED UP ALL THE BRAKE LINES. SO NOW IT'S TIME TO MOVE ON TO THE EXHAUST. NOW WE'RE GONNA RUN A SINGLE EXIT SYSTEM FROM THE TURBO ALL THE WAY TO THE BACK OF THE CAR. 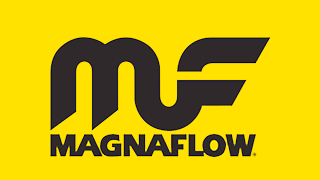 WE'LL USE THREE INCH PIPE FROM ONE OF MAGNAFLOW'S CUSTOM BUILDER KITS, AND THAT'LL MEET UP TO THIS PIPE THAT GOES DIRECTLY TO THE TURBO. CONNECTING TO THE OUTLET IS THE ORIGINAL PIPE SUPPLIED BY HELLION. IT ENDED UP BEING A PERFECT FIT FOR THE GALAXIE. SO THERE WAS NO NEED TO MAKE A NEW ONE. ATTACHING TO IT IS A THREE INCH MAGNAFLOW 90 DEGREE BEND. A BALL FLANGE IS BEING USED FOR EASE OF REMOVAL DOWN THE ROAD. UNDERNEATH WE CAN MARK THE STRAIGHT SECTION OF THE 90 TO THE HEIGHT WE NEED AND MAKE A CUT ON THE COLD SAW. NOW WE CAN TIG THEM TOGETHER USING OUR MILLER DIVERSION 165. WITH THAT PIPE WELDED ON, HERE'S WHERE IT GETS A LITTLE TRICKY, BUT A LITTLE CREATIVITY CAN WALK YOU RIGHT THROUGH A PROBLEM LIKE THIS. THE TRANSMISSION CROSSMEMBER ACTUALLY INTERSECTS WHERE WE WANT TO RUN THE EXHAUST. WE CAN'T GO UNDERNEATH IT BECAUSE IT'LL BE TOO LOW TO THE GROUND AND LOOK LIKE GARBAGE. WE CAN'T GO ABOVE IT BECAUSE THE FLOOR PAN'S IN THE WAY. SO HERE'S THE SOLUTION, AND IT INVOLVES THESE TWO MARKS. FIRST WE'LL CUT THE CROSSMEMBER AT THE MARKS WITH A SAWZALL, MAKING SURE TO STAY AS EVEN AS POSSIBLE WITH THEM. NOW WE'LL USE A PIECE OF FOUR INCH PIPE WITH A QUARTER INCH WALL THICKNESS TO TAKE UP THE GAP. I'VE STILL GOT TO TRIM THIS A LITTLE BIT TO MAKE A TIGHT FIT FOR A GOOD WELD. WITH THIS SECTION OF PIPE FITTED AND IN PLACE, I'LL BURN IT IN WITH THE TIG, AND VOILA. THINKING OUTSIDE OF THE BOX WORKED AGAIN. (PAT)>> WHILE WE'RE WAITING ON A FEW MORE EXHAUST PIECES I'LL GET TO WORK ON PUTTING IN THE FUEL INJECTION HARNESS. 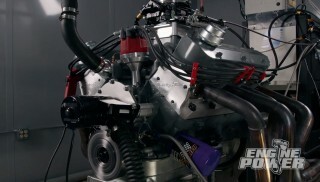 NOW THIS IS THE SAME ONE THAT WE USED DURING THE DYNO SESSION. SO IT GOES IN THE CAR. I'LL START BY PASSING IT THROUGH A HOLE DRILLED IN THE FIREWALL, AND ONTO THE PASSENGER SIDE FLOOR BOARD. WITH THE GROMMET ON THAT I'LL FASTEN DOWN LATER, THE HOLLEY HP ECU CAN BE PLUGGED INTO THE HARNESS AND FASTENED TO THE FLOOR. 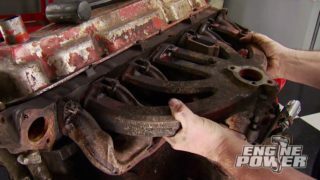 (MIKE)>> BEFORE WE MAKE ANY OF THESE CONNECTIONS TO THE ACTUAL ENGINE WE'RE GONNA GO AHEAD AND FINISH OUT THE ENGINE BAY. NOW THAT'S GOING TO INCLUDE SOME THINGS WE HAD TO MAKE. PLUS GETTING THE STARTER, RADIATOR, AND ALL THE COLD SIDE FOR THE TURBO MOUNTED UP. PERTRONIX PERFORMANCE PRODUCTS JUST RELEASED A NEW LINE OF HIGH PERFORMANCE STARTERS FOR SEVERAL DIFFERENT ENGINE TYPES. NOW IT'S A CONTOURED STARTED THAT FEATURES A SLEEK DESIGN FOR GREAT LOOKS. NOW THE SOLENOID IS ACTUALLY FULLY ENCLOSED TO PROTECT IT FROM THE ELEMENTS LIKE HEAT AND MOISTURE. IT CAN BE ROTATED TO CLEAR DIFFERENT HEADER TYPES OR OTHER ENGINE COMPONENTS IN TIGHT ENGINE BAYS. IT HAS A FOUR POINT FOUR TO ONE GEAR RATIO AND CRANKS OUT 200 POUND FEET OF TORQUE. FOR YOU GUYS WITH HIGH COMPRESSION ENGINES THAT NEED EXTRA CRANKING POWER THIS STARTER HANDLES THEM WITH EASE. (PAT)>> KEEPING OUR TURBO SMALL BLOCK FORD COOL IS THIS GRIFFIN EXACT FIT RADIATOR COMBO. NOW IT COMES TO YOU WITH DUAL 10 INCH SPALL FANS AND THEY'RE FITTED TO A REALLY NICE ALUMINUM SHROUD, WHICH ELIMINATES THE FANS BEING HOOKED DIRECTLY TO THE CORE. NOW THIS IS A DROP IN FIT FOR A STOCK GALAXIE. SO WE'RE GONNA HAVE TO DO A LITTLE BIT OF TWEAKING TO IT MAKE IT FIT WITH OUR GIANT INTERCOOLER. NORMALLY THE DROP IN RADIATOR WOULD BOLT TO A COUPLE OF TABS HERE ON THE BOTTOM, BUT BECAUSE THE WAY WE HAVE THE INTERCOOLER MOUNTED WE'RE GONNA HAVE TO DO SOMETHING A LITTLE BIT DIFFERENT. SO I'M GONNA TAKE A MEASUREMENT AND SEE HOW MUCH ROOM WE HAVE TO WORK WITH. WE SNUCK INTO DETROIT MUSCLE TO USE THEIR SHEET METAL BREAK. A ONE INCH BEND SHOULD DO THE TRICK. WE COULD ONLY GET THE BOTTOM BENT ABOUT 45 DEGREES. THAT GOT US ABOUT HALF WAY. SO THE REST OF THE WAY WILL BE TUNED IN WITH A MALLET. NOW WE CAN DRILL TWO HOLES IN THE CORE THAT LINE UP WITH THE ORIGINAL MOUNTING LOCATION ON THE FLANGE WE BENT. (MIKE)>> TWO QUARTER INCH NUTSERTS ARE INSTALLED AND CRIMPED INTO PLACE. 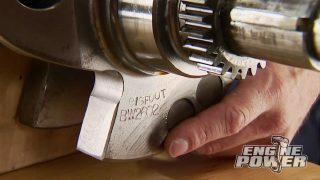 THIS IS A TOOL EVERY GEARHEAD SHOULD HAVE IN HIS TOOL ARSENAL. THE RADIATOR ASSEMBLY IS NOW LOWERED ALL THE WAY TO THE CORE AND TWO QUARTER INCH FASTENERS AND RUBBER ISOLATORS WILL SECURE IT AT THE BOTTOM. SINCE THE WHOLE ASSEMBLY IS IN A LOWER POSITION THAN STOCK, THIS FACTORY UPPER HOLD DOWN WON'T WORK. (PAT)>> SO WE MADE THESE OUT OF SOME ALUMINUM STOCK. WITH A SLIGHT BEND THEY FIT LIKE THEY SHOULD HAVE BEEN THERE. AN ISOLATOR WAS USED UNDER THESE AS WELL FOR CUSHIONING JUST LIKE THE BOTTOM, AND WITH THAT SOLID WORK WE ARE TAKING A BREAK. (PAT)>> THE GALAXIE'S FINAL FRONTIER IS WELL UNDER WAY. SO FAR WE'VE COMPLETED THE BRAKING SYSTEM, MOUNTED THE INTERCOOLER, INSTALLED THE RADIATOR ASSEMBLY, AND STARTED RUNNING THE EXHAUST FROM THE HOT SIDE OF THE TURBO TOWARDS THE REAR OF THE CAR. (MIKE)>> WE ALSO MOUNTED THE HOLLEY ECU AND RAN THE HARNESS THROUGH THE FIREWALL. NOW IT'S TIME FOR THE COLD SIDE PIPING, ALL THE WAY FROM THE TURBO TO THE THROTTLE BODY. TIGHT SPOTS CAN BE A CHALLENGE. THERE'S NOT MUCH ROOM BETWEEN THE COMPRESSOR OUTLET AND INTERCOOLER INLET. SO WE HAD TO GET CREATIVE, AND USED A VIBRANT HD CLAMP ASSEMBLY ON THE COOLER SIDE, AND A SLIGHT BEND THAT USES A COUPLER TO CONNECT TO THE COMPRESSOR. ON THE OTHER SIDE OF THE COOLER ANOTHER VIBRANT HD CLAMP IS USED TO CONNECT THE CHARGE PIPE MADE OF THREE AND A HALF INCH ALUMINUM VIBRANT PIPE. THE FINAL CONNECTION IS AT THE PLENUM THAT SITS ON TOP OF THE THROTTLE BODY. NOW A BLOW OFF VALVE IS INSTALLED ON THE STAND OFF ATTACHED TO THE CHARGE PIPE. (PAT)>> THE BLOW OFF VALVE'S JOB IS VERY IMPORTANT. IT WILL RELEASE THE PRESSURE IN THE INTAKE SYSTEM WHEN THE THROTTLE IS SNAPPED CLOSED. NOW THAT WILL ELIMINATE COMPRESSOR SURGE AND THE POSSIBILITY OF BLOWING OUT ANY OF THE GASKETS IN THE INDUCTIONS SYSTEM. WITH MOST OF THE BIGGER TICKET ITEMS TAKEN CARE OF IT'S TIME TO START ADDRESSING SOME OF THE SMALLER ONES. NOW EVERY PROJECT HAS THEM AND THEY CAN TAKE ABSOLUTELY AS LONG OR EVEN LONGER THAN THE BIGGER ITEMS. THE BATTERY WAS MOUNTED IN THE TRUNK ALONG WITH A NEW DISCONNECT SWITCH. ON THE NEGATIVE SIDE THE BATTERY WAS GROUNDED DIRECTLY TO THE CHASSIS, AND ON THE POSITIVE SIDE A CABLE RUNS UP TO ONE SIDE OF THE DISCONNECT. ON THE OTHER SIDE ANOTHER CABLE IS ATTACHED AND RUNS DOWN THROUGH A GROMMET IN THE FLOOR ALL THE WAY TO THE FRONT AND ATTACHED TO THE BIG TERMINAL ON THE STARTER MOTOR. YOU CAN HOOK EITHER BATTERY CABLE TO THE DISCONNECT, BUT WE ARE GOING TO USE THE POSITIVE SIDE AND HERE IS WHY. MOST RACING SANCTIONING BODIES REQUIRE YOU HOOK IT TO THE POSITIVE THE SIDE. THAT'S BECAUSE WHEN YOU BREAK IT AT THE POSITIVE IT KILLS THE VOLTAGE TO THE ENTIRE VEHICLE. IF YOU TRY THE SAME THING ON THE NEGATIVE SIDE SOMETIMES THE ENGINE WILL STAY RUNNING BECAUSE THE VEHICLE STILL HAS CHASSIS GROUND AT THE ENGINE, AND WE WANT THIS THING TO DIE WHEN WE TELL IT TO DIE. 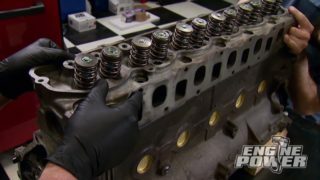 (MIKE)>> WE'RE GOING TO USE THE SOLENOID BUILT INTO THE STARTER, WHICH ALLOWS US TO ELIMINATE THE EXTERNAL FORD TYPE ONE THAT WAS USED IN THE CAR BEFORE. THE CABLE'S JOURNEY ENDS HERE AT THE LARGE POST ON THE STARTER. THE RADIATOR DID NOT HAVE A FILLER NECK. 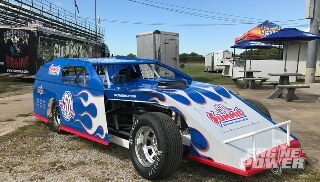 SO WE ORDERED THIS INLINE ONE FROM SUMMIT RACING. THE FRONT COIL OVER RESERVOIRS WERE ALSO MOUNTED. THE BRACKETS WERE SUPPLIED BY CHASSIS WORKS AND MADE IT A SIMPLE INSTALL. IN THEIR LOCATIONS PAT CAN MAKE ADJUSTMENTS EASILY. MORE WIRING HAD TO BE DONE INSIDE THE CAR DUE TO THE NEW FLAMING RIVER STEERING COLUMN. NOW THIS CONNECTOR RIGHT HERE SUPPLIES THE SIGNAL TO EVERYTHING LIKE THE HORN, THE HAZARDS, AND THE LEFT AND RIGHT TURN SIGNALS. IT HAS TO BE WIRED TO THE FACTORY HARNESS, AND THEY SUPPLY A CONNECTOR AND TERMINALS TO GET THE JOB DONE, AND IT CONNECTS THAT EASY. (PAT)>> WE DON'T ALWAYS SHOW IT, BUT EVERY VEHICLE PROJECT WE DO HERE IN ENGINE POWER HAS A TODO LIST OF THINGS TO COMPLETE. NOW AS THINGS GET CHECKED OFF INEVITABLY MORE THINGS GET ADDED TO IT AS IT COMES UP BECAUSE THAT'S COMMON IN A PROJECT OF THIS SCOPE. MIKE JUST GOT DONE WIRING THE COLUMN BUT WE STILL HAVE A WHOLE BUNCH OF STUFF TO DO, AND WHEN WE COME BACK FROM THE BREAK WE ARE GOING TO DO OUR BEST TO MAKE THIS LIST EVEN SHORTER. (MIKE)>> THE BREAK IS OVER BUT OUR WORK IS NOT. I'M GONNA GO AHEAD AND START RUNNING THE HOLLEY EFI HARNESS TO ALL OF THE CONNECTIONS DOWN IN THE ENGINE BAY. NOW SOME OF THESE THINGS ARE IN PRETTY TIGHT AREAS THAT THE CAMERA WON'T BE ABLE TO SEE, BUT YOU'LL GET THE IDEA AS WE GET THEM ON. 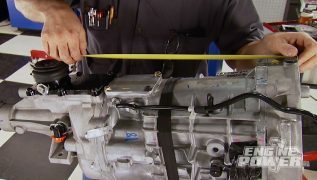 THE FIRST CONNECTION FROM THE MAIN HARNESS IS TO THE INJECTOR HARNESS, WHICH IS CONNECTED TO ALL EIGHT FUEL INJECTORS. NEXT IS THE IGNITION CONNECTOR FROM THE HARNESS, WHICH THE PIGTAIL FROM THE DUAL SYNC DISTRIBUTOR PLUGS INTO. THE IDLE AIR CONTROL CONNECTION IS NEXT. IT'S ON THE BACK OF THE THROTTLE BODY. THE ECU ALSO NEEDS TO SEE THROTTLE POSITION. SO IT'S CONNECTED NEXT. A THREE BAR MAP SENSOR ALSO NEEDS TO BE USED AND THE HARNESS HAS A CONNECTOR FOR IT TOO. (PAT)>> NEXT UP IS THE IGNITION SYSTEM. WE'RE GONNA BE PUTTING IN AN MSD SIX AL BOX WITH BUILT IN REV CONTROL. NOW IT'S GONNA WORK SEAMLESSLY WITH OUR HOLLEY HP FUEL INJECTION, AND I'M PUTTING IT BACK IN THE CAR THE WAY THE OLD ONE WAS HOOKED IN, WITH SOME GOOD OLE FASHIONED INDUSTRIAL STRENGTH VELCRO. I HAD TO KEEP A BIT OF THE OLD WITH THIS CAR. SO I'M REUSING THE MSD HVC TWO COIL. INTERESTINGLY ENOUGH THIS IS ONE OF THE COILS THAT HELPED WIN THE 2010 NHRA PRO STOCK WORLD CHAMPIONSHIP WITH GREG ANDERSON BEHIND THE WHEEL. 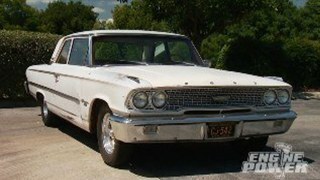 (MIKE)>> SAD TO SAY WE DIDN'T MEET OUR GOAL OF FIRING THE GALAXIE UP TODAY BUT WE ARE SUPER CLOSE. NOW ALL THE LITTLE THINGS ADD UP AND DO TAKE QUITE A BIT OF TIME, AND TIME IS WHAT WE RAN OUT OF. NOW THIS HAS BEEN A SUPER FUN PROJECT TO WORK ON AND WE CAN'T WAIT TO HEAR IT UNDER IT'S OWN POWER. (PAT)>> WHICH IS HOW YOU'LL SEE IT NEXT TIME, TEARING UP THE ROLLERS OF THE CHASSIS DYNO IN OUR QUEST FOR 1,000 HORSEPOWER AT THE TIRE. NOW BE SURE YOU TUNE IN TO SEE HOW CLOSE WE CAN GET TO OUR GOAL, BUT THIS NEW TODO LIST IS WHAT WE HAVE TO KNOCK OUT BEFORE THAT ALL HAPPENS. (MIKE)>> THIS IS MILLER'S NEW MILLERMATIC 211 THAT IS PACKED FULL OF NEW FEATURES. IT'S THE EASIEST WELDER TO USE THANKS TO THE ADVANCED AUTO SET FEATURE THAT NOW INCLUDES FIVE DIFFERENT WIRE GAS COMBINATIONS FOR THREE DIFFERENT WIRE SIZES. THE NEW ANGLED CAST ALUMINUM DRIVE SYSTEM WITH CALIBRATED TENSION KNOB CREATES CONSISTENT FEEDING AND EASY SETUP. THE MVP, OR MULTI VOLT PLUG, GIVES YOU THE OPTION OF COMMON 120 OR 240 VOLT RECEPTACLES, AND INVERTER TECHNOLOGY COMBINES THE BEST IN CLASS ART CHARACTERISTICS AND THIS MACHINE IS VERY PORTABLE WEIGHING IN AT ONLY 38 POUNDS. (PAT)>> KEEPING YOUR ENGINE FREE OF ACCUMULATED DEPOSITS IS CRITICAL, AND MOTOR FLUSH FROM MOTOR MEDIC DOES JUST THAT. BEFORE YOUR NEXT OIL CHANGE SIMPLY POUR ONE BOTTLE INTO YOUR ENGINE AND START AND RUN IT FOR FIVE MINUTES. IT CIRCULATES THROUGH THE OIL SYSTEMS DISSOLVING AN GUMS, VARNISHES, OR SLUDGE AND IMPROVING OIL CIRCULATION. 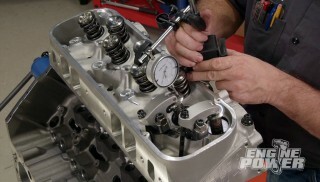 NOW IT WON'T' HARM BEARINGS OR SEALS, AND WILL EVEN HELP FREE UP STICKY VALVES AND PISTONS RINGS. NOW THIS IS NATURALLY ASPIRATED ENGINES ONLY. 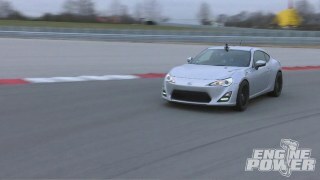 TURBOCHARGED ENGINES GET A SYNTHETIC VERSION. 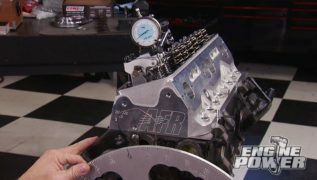 (MIKE)>> IF YOU ARE PLANNING ON SWAP OUT A CARBURETOR FOR AN EFI SETUP HERE'S AN EASY SOLUTION FOR THE FUEL SYSTEM. 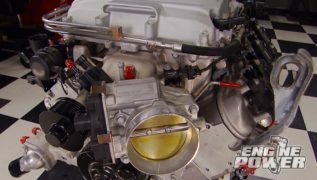 EDELBROCK HAS AN ADJUSTABLE FUEL SUMP SYSTEM, AND HERE'S HOW IT WORKS. YOUR FACTORY FUEL LINES AND FUEL PUMP FEED FUEL IN AND FILL UP THIS SUMP. THEN A HIGH PRESSURE PUMP MOUNTED INSIDE FEEDS PRESSURIZED FUEL TO YOUR FUEL RAIL. IT'S ADJUSTABLE FROM 30 TO 90 PSI AND SUPPORTS UP TO 600 HORSEPOWER. THERE'S NO UNDER CAR PLUMBING NECESSARY AND THE KIT COMES WITH EVERYTHING YOU NEED FOR A SUPER EASY INSTALL. 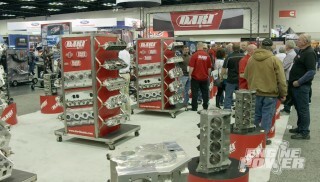 YOU CAN FIND IT ALL AT SUMMIT RACING DOT COM. TODAY'S TECH TIP DEALS WITH BLACK MAGIC. NO, JUST KIDDING, IT'S TORQUE CONVERTERS, BUT A LOT OF PEOPLE THING THERE'S BLACK MAGIC INVOLVED TO GET THE RIGHT CONVERTOR FOR YOUR RIDE. TODAY WE'RE GONNA COVER HOW A CONVERTER WORKS AND WHAT'S INSIDE OF THEM. A TORQUE CONVERTER'S JOB IS TO TRANSFER THE POWER OF THE ENGINE INTO AN AUTOMATIC TRANSMISSION SOMEWHAT INDEPENDENTLY OF THE ENGINE. THINK OF IT AS FLUID COUPLER. TRANSMISSION FLUID INSIDE THE TORQUE CONVERTER IS CENTRIFUGALLY DRIVEN BY A SERIES OF PRECISELY MADE FINS THAT ARE BRAZED INTO THE CONVERTER HOUSING CALLED THE PUMP. AT A GIVEN ENGINE RPM, ALSO KNOWN AS STALL SPEED, FLUID IS TRANSFERRED TO THE OPPOSITE SIDE OF THE CONVERTER AND RIVES A TURBINE. AS THE ENGINE'S RPM'S INCREASE THE FLUID TRANSFER RATE INCREASES, PUTTING MORE PRESSURE ON THE TURBINE TO ACCELERATE THE VEHICLE. 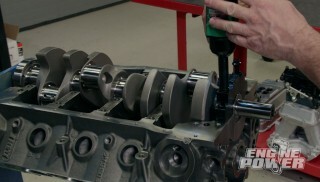 THE TURBINE IS ATTACHED TO THE SPLINE SHAFT THAT GOES INTO THE TRANSMISSION. (PAT)>> A TORQUE CONVERTER PERFORMS THE SAME DUTIES IN AN AUTOMATIC THAT A CLUTCH SETUP DOES IN A MANUAL, EXCEPT THERE'S NOT THIRD PEDAL. AT LOW RPM'S THE ENGINE IS PRODUCING VERY LITTLE TORQUE, AND THERE'S VERY LITTLE FLUID TRANSFER HAPPENING. SO KEEPING THE CAR STOPPED AT A STOP LIGHT IS EASY AS LIGHT BRAKE PRESSURE. KIND OF LIKE WHEN YOU CLUTCH A CAR WHEN YOU'RE ROLLING TO STOP. (MIKE)>> TORQUE CONVERTERS COME IN SEVERAL DIFFERENT SIZES BASED FOR THEIR SPECIFIC APPLICATION. NOW NOT ONE TORQUE CONVERTER WILL WORK FOR EVERY SETUP. A TORQUE CONVERTER IS SPEC'ED BASED OFF OF THE CAR, THE ENGINE, AND THE TRANSMISSION COMBINATION. (PAT)>> IN RACING APPLICATIONS THE CONVERTER IS DESIGNED TO KEEP THE ENGINE IN ITS POWER BAND AND NOT FALL BELOW PEAK TORQUE. (MIKE)>> THIS CONVERTER IS A RACE STYLE LOCK UP TYPE THAT HAS A FEW EXTRA PARTS THAN A STANDARD CONVERTER BUT THEY ALL WORK THE SAME WAY. NOW A CUTAWAY LIKE THIS GIVES YOU A GREAT VISUAL AND IT'S EASY TO UNDERSTAND. PLUS YOU DON'T HAVE TO CUT ONE APART YOURSELF. THE IMPELLER, OR PUMP, AND THE BILLET LID ARE WELDED TOGETHER. SO THEY TURN AT THE SAME RPM AS THE ENGINE. NOW THE PUMP'S FINS ARE TYPICALLY FURNISH BRAZED AT PRECISE ANGLES. THE FINDS DIRECT THE FLUID TO THE OUTER RING OF THE PUMP. THAT FLUID THEN FLOWS BACK ACROSS THE OUTER SECTION OF FINDS ON THE TURBINE, WHICH DRIVES IT. THEN THE FLUID EXITS THE TURBINE THROUGH THESE FINS IN THE CENTER AND HEADS TO THE STATOR. (PAT)>> THE STATOR IS THE BRAINS OF THE CONVERTER, AND ARGUABLY THE MOST IMPORTANT PART. ITS JOB IS TO MULTIPLY THE TORQUE FROM THE ENGINE. FLUID FLOWS THROUGH THE CENTER OF THE STATOR, WHICH ALSO HAS ANGLED FINS. INSIDE THE STATOR IS A ONE WAY CLUTCH THAT ALLOWS THE FLUID IT TURN IT IN ONLY ONE DIRECTION TO REVERSE THE FLUID ANGLE AS IT FLOWS BACK TO THE PUMP, PUSHING THE FLUID FASTER, WHICH DRIVES THE TURBINE HARDER TO CATCH UP WITH THE ENGINE'S RPM. WE'LL DIG DEEPER INTO CONVERTERS A LITTLE LATER. SO UNTIL THEN, STAY FLUID. (MIKE)>> MAKE SURE TO KEEP YOUR EYES OPEN FOR THE GALAXIE. YOU NEVER KNOW WHERE YOU'LL SEE IT NEXT, BUT WE'LL SEE YOU NEXT TIME RIGHT HERE FOR MORE ENGINE POWER.